As part of its Convocation Lecture Series, Syracuse University College of Law welcomes its second speaker, David Nimmer, who is of counsel to Irell & Manella LLP in Los Angeles and professor from practice, UCLA School of Law. His lecture, “Hendrix in Hendricks: The Tangle of Music Copying (George Harrison, Michael Bolton, Biz Markie and Beyond)” will be held Friday, Nov. 1, at noon in Hendricks Chapel. Attendance is required for first-year law students. Public parking is available in the Irving Garage. He also served as a visiting professor at UCLA Law School and distinguished scholar at the Berkeley Center for Law and Technology. In 2000, he was elected to the American Law Institute. Nimmer lectures widely in the copyright arena. 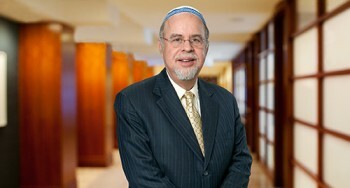 Besides in-house seminars (such as for the legal staffs of Turner Broadcasting in Atlanta and Times Mirror in New York and Los Angeles), he has lectured around the world — at MILIA in Cannes, ALAI in Tel Aviv, LUISS in Rome, IMPRIMATUR in London and the Copyright Society of Japan in Tokyo, and regularly to bar organizations in California and throughout the U.S.
Nimmer earned an A.B. degree with distinction and honors in 1977 from Stanford University and a J.D. degree in 1980 from Yale Law School, where he served as editor of the Yale Law Journal.